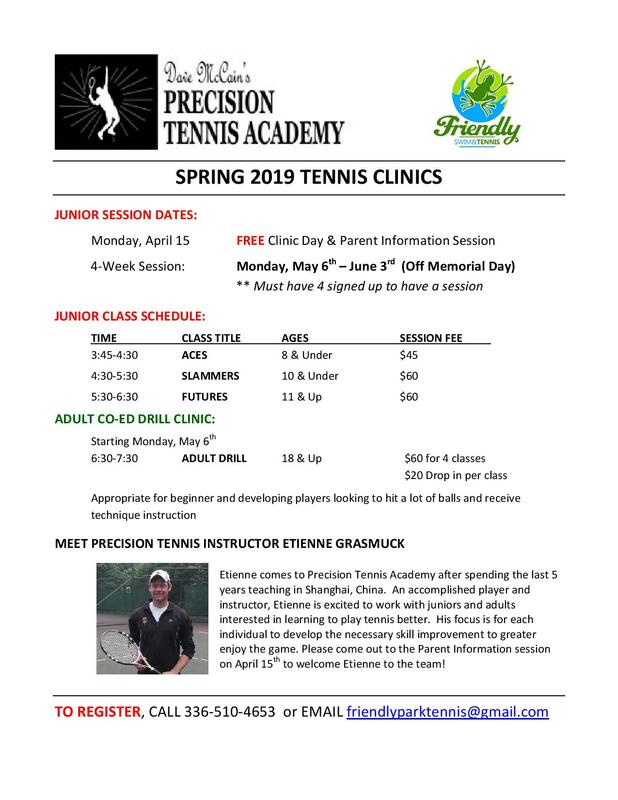 Please check back for 2019 Summer tennis at Friendly information! Friendly Park will have its annual Parent /Child tournament on Saturday, June 23, beginning at 1:00. All ages eligible but there will only be one age division unless we have a number of younger players sign up. Playing with a family member is strongly encouraged but not required. Players without a family partner please email Kent at kah80@hotmail.com and I will pair you with another player where possible. You may also find your own partner. Child players can be up to 16 years old. Prizes for first and second place are private lessons from our pros. Sign up deadline is noon on Friday 6/22, please email Kent at kah80@hotmail.com to sign up with yours and your partner's name. Play schedules will be published by 5:00 Friday evening. Tournament format depends on the number of entries but every team will have at least 2 matches. This is planned to be a one-day tournament. Friendly and Precision Tennis are in our 10th year of partnering to provide a successful, growing Tennis Program at Friendly Park Pool. We request that each member (and their guests) be respectful of others while playing on Friendly’s courts and always wear appropriate tennis shoes (remember NO black bottom shoes are allowed on the courts at any time) when playing. The ball machine is available for rental at $5 per hour. 1) Check availability at the check-in table or snack stand. If available, pay a fee. You will also leave your driver’s license and get the shed key. 2) You must be 16 years of age to use the equipment unsupervised. Younger children may use the machine if supervised by the person who checked it out. 3) Instructions for use will be posted on the inside wall of the shed. 4) Please remember to plug the charger in when finished. 5) Never walk directly in front of the machine while it is running! There are usually delays in feeding the last few balls so always approach from one side until the power is off.